A slinky black leotard, extravagant glitter and artfully ripped fishnets are a few of the finishing touches you’ll need before heading out on a – likely – cold and rainy night to attend the Annual Transylvania Convention. Or, more likely, you’re on your way to partake in one of the most drag-wonderful Halloween traditions dating back to the late 1970’s: the Rocky Horror Picture Show. Although sitting around your television, watching Susan Sarandon become a “creature of the night” and reminiscing with friends about how Tim Curry wooed you into a newfound sexuality can certainly be quite the way to spend an evening, around Halloween, true Rocky Horror fans flock to local theaters to take part in the action – literally. 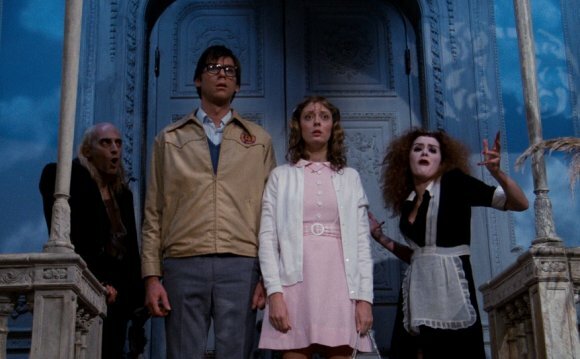 Here’s where Rocky Horror Picture Show is showing this Halloween around Western New York. For the crafty among us, dressing up for the Rocky Horror Picture Show Party at the Riviera Theatre is a not just fun – it’s a challenge. If you manage to mold yourself into the perfect Janet Weiss, or Dr. Frank N. Furter, or even Columbia, you might just snag the Best Rocky Horror Costume. Or, cut those fishnets and pop on your biggest Victoria’s Secret push-up to try to win Sexiest Costume. And of course, the Most Creative costume will score its own prize. The Riviera makes a whole night of the event – before the film begins at midnight, you can watch the Ladies of Illusion with Jayme Coxx and Eye Candy Burlesque perform. Once the lights dim and the film begins, the cast of The Francis Bacon Experiment will take the stage, performing alongside the Rocky Horror Picture Show. For an extra bonus, if you bring your ticket to the Rocky Horror Picture Party to the Riviera Theatre on Oct. 29 you’ll receive free admission to a showing of The Exorcist. Two horror shows for one? Who wouldn’t be down with that? Friday, Oct. 30, 2015 @ 11:59 p.m.
Saturday, Oct. 30, 2015 @ 11:59 p.m.
Maybe you want to “give yourself over to absolute pleasure” two nights this upcoming Halloween weekend – and Lockport’s Historic Palace Theatre is totally cool with that. On both Friday and Saturday night the theater will be showing The Rocky Horror Picture Show at midnight. And if you really want to get in on the action on-screen, pick up a prop bag when you enter. Be prepared for a “bit of a mind flip”. If getting dressed up for just one day of the year – Halloween – is enough for you (or your stubborn significant other), heading out to East Aurora to watch The Rocky Horror Picture Show on the big screen might be just right. The historic theater will show the film only on Friday night, leaving you with more than enough energy for the big Saturday Halloween we’ve all been waiting for. And with tickets costing less than minimum wage, you can afford to bring a date and buy the large popcorn. Saturday, Oct. 31 @ 11:59 p.m. If you find yourself in the Village of Hamburg on Halloween night – maybe after handing out endless candy to the neighborhood ghouls, Elsa’s and Jason’s – make sure to get dressed up for the Rocky Horror Picture Show tradition at the historic Hamburg Palace Theatre. Although the sounds of a live ten piece orchestra no longer fill the 1920’s-era theater during performances, on this Halloween night, you can sing and dance along to “Timewarp” and “Damnit Janet” and rival the original.